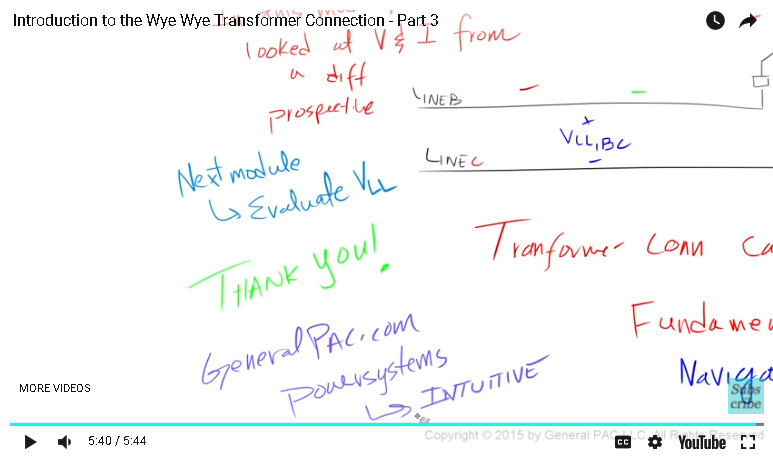 The three phase transformer WYE-WYE connection and the introduction to the infamous square root 3, module 3. We talked about voltages and currents quantities in the last module. 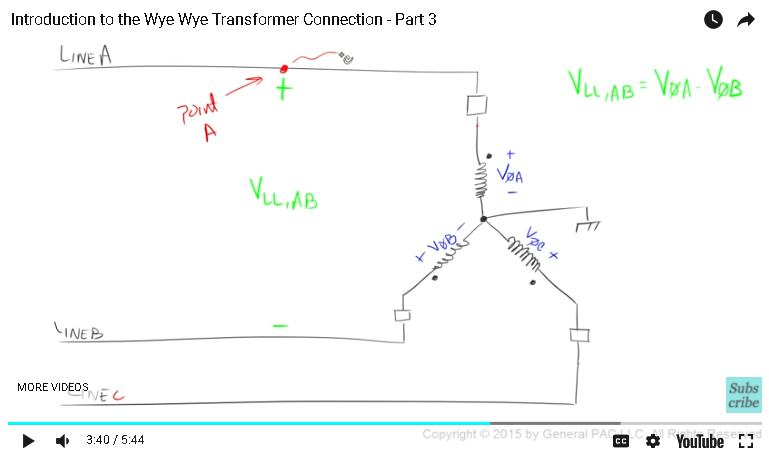 In this module, we will cover voltages and current quantities from a different perspective. Let's begin, by illustrating winding A, the polarity side of winding A is indicated by a round dot and this small box here indicates the bushing of the winding A. In this illustration, we are not going to cover secondary windings. The non-polarity side of all three windings are connected together by a neutral wire & a neutral wire is grounded. The voltage developed across winding A is our Phase A voltage measured from the polarity side to the non-polarity side of winding A. Similarly, we have phase B voltage and phase C voltage. Line A, line B and line C are all connected to their respective bushings. 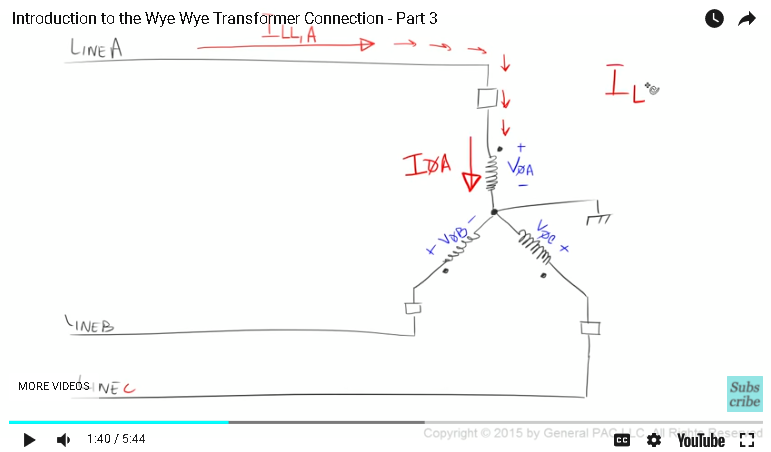 For a Y connected transformer, we can expect that the line to line currents and phase currents to be equal. 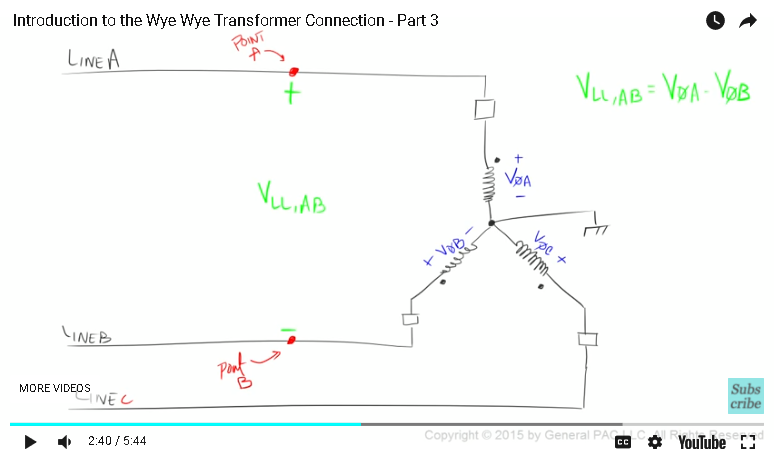 so for a Wye connected transformer, we can expect that the line to line currents is equal to the phase currents. We understand that the phase voltages are measured across transformer windings, while line to line voltages are measured across two different lines. 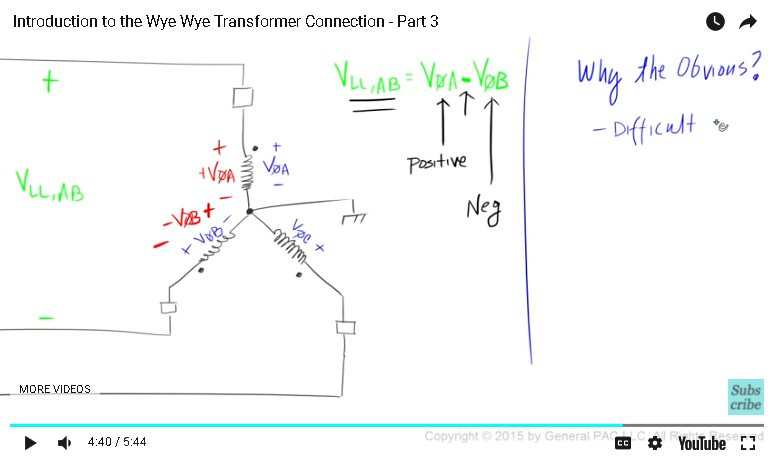 For a Wye connected transformer, we can expect that the line to line voltage to be different than the phase voltages. Its very clear from this illustration that the line to line voltage across line A and line B encompases Phase A winding and phase B winding. we label the point of measurements with a line to line voltage as point A and point B. Now relatively speaking, we can expect that the voltage on point A and the voltage on the bushing of winding A to be the same. Right, so what about the voltage on the polarity side of winding A respectively. We are pretty confident that it’s pretty much the same voltage, since it's the same point on the line. Now, what if we measure the voltage from the polarity side of winding A to the non-polarity side of winding A. We are gonna get a different voltage. To be very clear, we get phase A voltage, at this point, we are on the non-polarity side of winding A, where the neutral wire is connected to the ground. we measure across the polarity side of winding A to the non-polarity side of winding A, to get the phase A voltage. Okay, so now we measure from the non-polarity side of winding B to the polarity side of winding B, to get to Point B and the volatage from the non-polarity side of winding B to the polarity side of winding B is the negative phase B voltage. And that’s why the line to line voltage across Line A & Line B is equal to the phase A voltage minus Phase B voltage. Phase A voltage is considered as the positive value where as Phase B voltage is considered as the negative value. Some of us, may ask, that why we are going over to the obvious, because for me, this concept was difficult and vague when I was learning it. It was easier for me to attribute phase A voltage as the positive value and phase B volatage as the negative value. when I started thinking about the polarity marks and the point of measurements. Also the transformer connections can get very complex, very easily. It’s incredibly important for us to understand the fundamentals intuitively. So we can navigate through complex connections with some level of confidence. In this module, we looked at voltages and current quantities from a different perspective.In the next module, we will evaluate the line to line voltage equations.Thank you. 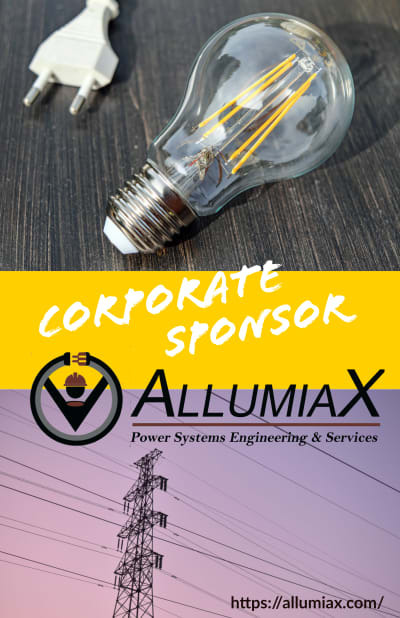 This module was brought to you by GeneralPac.com….making Power Systems Intuitive.